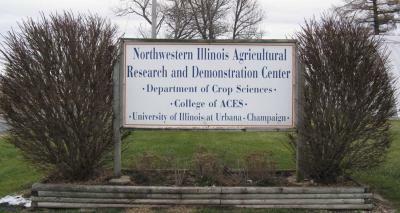 Have you always wondered what happened at the University of Illinois' Northwestern Illinois Agricultural Research and Demonstration Center just outside of Monmouth on 210th Avenue? To find out, join us at the Monmouth Country Club (1451 E. 3rd Avenue) at 1 p.m. on March 11th for 2013: A Research Year in Review. We will be discussing the results of some of the research that took place at the Northwestern Illinois Agricultural Research and Demonstration Center in 2013. Emerson Nafziger, Professor and Crop Production Extension Specialist, will talk about the results of many of his agronomic trials and how they may inform crop production decisions. Center Superintendent Brian Mansfield will review the 2013 growing season and talk about the whys and wherefores of small-plot research. Angie Peltier, Extension Educator, will discuss the results of several corn and soybean fungicide trials and how 2013 results fit into the larger picture.